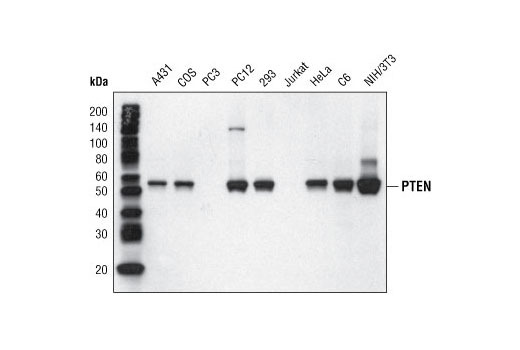 Western Blot analysis of extracts from various cell lines using PTEN (138G6) Rabbit mAb (Biotinylated). Immunoprecipitation of extracts from NIH/3T3 cells using PTEN (138G6) Rabbit mAb (Biotinylated) and Immobilized Streptavidin (Bead Conjugate) #3419 (Lane 1). Lysate and beads alone are shown in lane 2. Western blotting was performed with PTEN (26H9) mouse mAb #9556. 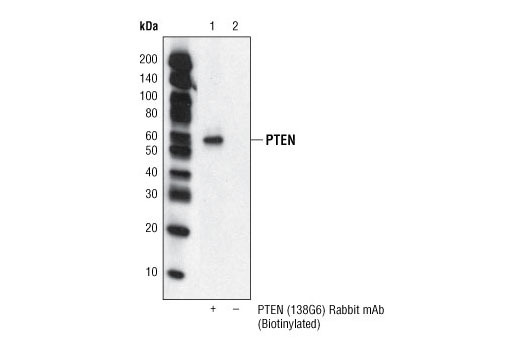 PTEN (138G6) Rabbit mAb (Biotinylated) detects endogenous levels of total PTEN protein. Monoclonal antibody is produced by immunizing animals with a synthetic peptide corresponding to the carboxy-terminal sequence of human PTEN. This Cell Signaling Technology antibody is conjugated to biotin under optimal conditions. The unconjugated PTEN (26H9) Mouse mAb #9556 reacts with human, mouse, rat, monkey and hamster PTEN. CST expects that PTEN (138G6) Rabbit mAb (Biotinylated) will also recognize PTEN in these species.